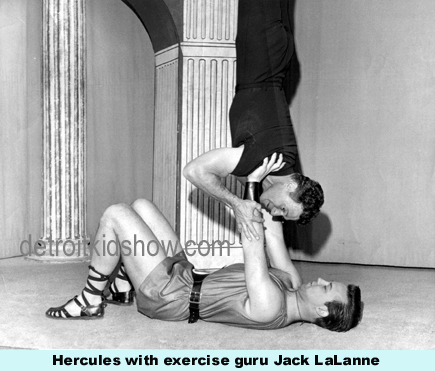 Between 1957 and 1965 a popular series of films was produced featuring the mythical Greek hero Hercules. Exported from Italy and distributed worldwide, the films proved to be box office dynamite in the United States. Hoping to profit from the Hercules craze, Trans-Lux television productions created 128 five minute animated Hercules cartoons. CKLW-TV in Detroit/Windsor purchased the cartoon package for their popular afternoon block of local kids shows. To host the cartoons, CKLW hired Don Kolke, an athletic young man who was more than capable of filling the Mighty Hercules’ sandals. Don Kolke was born in July 1940 to Frank and Phyllis Kolke. He lived in the Harper/Van Dyke area of Detroit until moving to the city of East Detroit with his parents and three year old sister in 1945. Don attended St. Veronica grade school and played football on the Catholic Youth Organization football team, runners up to the champions in 1953. While attending Notre Dame High School in Harper Woods, he scored the first recorded touchdown for the “Fighting Irish” in their history. After earning eight varsity letters in football and baseball as the starting halfback (offense and defense) in football and the centerfielder in baseball, he was recruited by various universities, including Michigan State and the University of Detroit. Don accepted a football scholarship at U of D, where he played for two years until a torn cartilage in his right knee ended his football career. For his senior year he won one of two $1000 WWJ-AM-FM-TV scholarships awarded to U of D for his work in his Major, Communication Arts, and his daily hosting of a 15 minute news magazine show on WTVS Channel 56. Upon graduating from U of D with a Bachelor of Arts degree, Don worked for TV Guide and Seventeen magazines as their Metro Detroit Promotion Manager, appearing on many Detroit TV shows to promote his magazines, including Bill Kennedy’s Showtime, Rita Bell’s Prize Movie and the Lady of Charm with Edythe Fern Melrose. Looking to get back into the talent end of TV, Don arranged an interview with Tom Sutton, CKLW-TV’s program director. When Sutton asked Don if he could do a show like Bill Kennedy, he replied, “of course.” Don was told to check back in two weeks, because “We may have a show for you.” Two weeks later, Don was told by Sutton that he had a costumed kids show that he felt Don had the right size and personality to do. When Sutton said, “Promise you won’t hit me when I tell you what the show is?” Don replied, thinking it might be a clown show, “I can’t make that promise.” Sutton then tossed a Hercules comic book across his desk to Don. Sutton explained, “You will be the writer, producer and Hercules hosting Hercules cartoons and film shorts for kids. It will be your show to do what you want to do “in character” to fill approximately 15 minutes a day live, introducing the cartoons and shorts and six one minute commercial breaks.” Thinking that he could make the character a helpful hero, Don accepted. Don helped design the set and put together a show featuring stories from Greek Mythology, physical fitness exercises (primarily calisthenics from his football days) and some comic relief from Hercules’ alter ego Newton, a centaur (front half boy and back half horse) who appeared in the Hercules cartoons. To make Newton come to life, Don pre-recorded Newton’s voice, with pauses for Hercules to speak to him, and had the studio’s floor manager (there was no live audience in the small studio) wave the branch of a tree in front of the camera while Newton spoke, explaining that Newton was so shy that he hid behind a tree while speaking to Hercules. 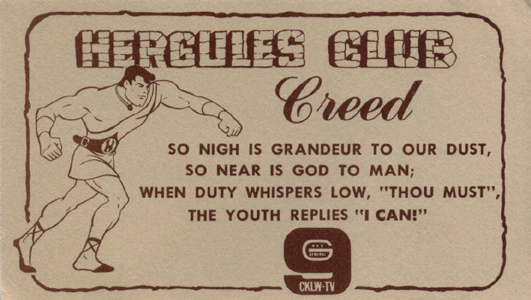 Hercules premiered on September 16, 1963 running daily, Monday thru Friday, from 4:30 to 5:00 PM. It led into the Larry and Jerry Show (starring former Jingles in Boofland alumni Jerry Booth and Larry Sands) for about six months, then Popeye and Pals with Captain Jolly for the rest of its run. Hercules was rated #1 in its time period for 46 of the 52 weeks it was on the air. 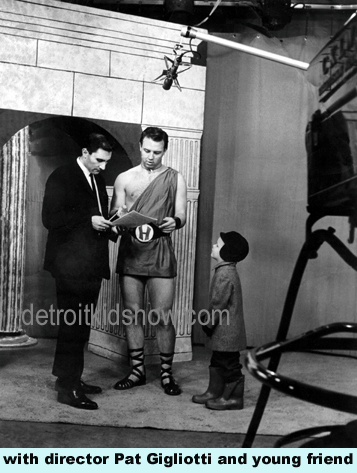 In addition to Hercules cartoons and Tales of the Riverbank shorts, the show featured a weekly guest, the head of the Greater Detroit Safety Council, who gave Hercules’ young viewers advice on safety. The Council produced a special brochure with Hercules on the cover, “Hercules Says”, featuring safety tips that, at Don’s insistence, were primarily “do’s” rather than “don’ts” because he reasoned that his young friends had heard enough “don’ts” in their everyday lives. In 1963 Hercules appeared in the J.L. Hudson’s Thanksgiving day parade in a newly designed cape to keep him somewhat warm, and at various other parades and events. He also was active in shows for the Boy and Girl Scouts and other young people’s organizations with a safety-themed magic act and to sign autographs. In addition, Hercules made appearances at various Little Caesars restaurant grand openings in Metro Detroit, including Mike Illitch’s first Little Caesars restaurant in Garden City. In September 1964, the parent company of CKLW-TV, RKO General, decided to drop all of its children’s programs in favor of more adult fare. 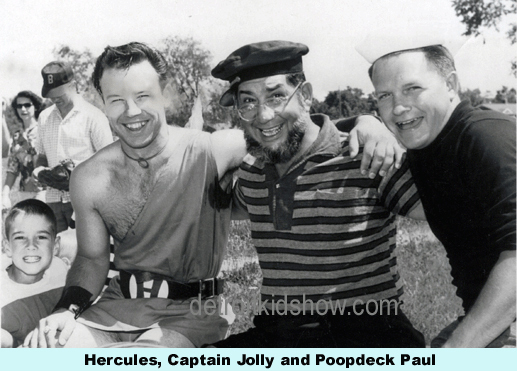 By the end of the year Hercules, Captain Jolly and Poopdeck Paul were unceremoniously dropped from the schedule. 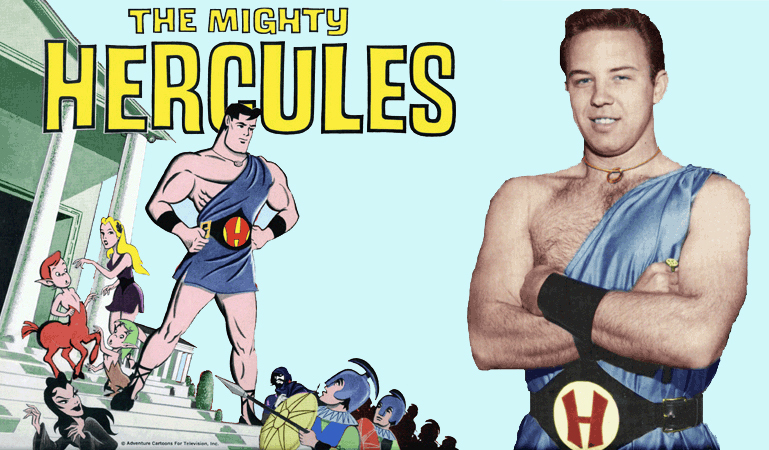 Don was asked to pre-record 1 ½ hour shows, as Hercules, from September thru December of 1964 to be shown on Saturday mornings, so the station could take advantage of the heavy toy advertising during this time period. He agreed and pre-recorded a show each Wednesday for viewing on Saturday, right up to the week before Christmas, 1964. Hercules last Hurrah aired on Saturday December 19, 1964, when Don announced that Hercules “would miss his young friends, but he was moving on,” and that their hero was to be married on the next Saturday to “the most beautiful, wonderful girl in the world, Judy Sullivan.” When the final show aired, Don had arranged for a florist to deliver seven roses to Judy, then the next day six roses and the next day five roses, all counting down so that the final rose was delivered on Friday, the day before their wedding day of December 26, 1964. After the Hercules show Don entered the advertising business, selling outdoor advertising, radio and TV spots and planning and buying media for various clients. Don retired in February 2000 and is currently enjoying participating in various sports such as senior tennis, pickleball and golf, and with his “most beautiful and wonderful” equally sports active wife, Judy, enjoying their five children and spouses and their twelve grandchildren.